Utah Autism Coalition: Raise Awareness to Congress - This Week!!! 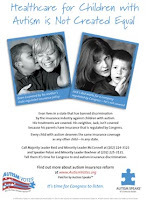 This week, Autism Speaks is launching a major ad campaign supporting federal autism insurance reform! Our goal is to be the loudest group on Capitol Hill this week. To accomplish this, we have launched this ad campaign in various publications to raise awareness about the need for Congress to act on federal autism insurance reform and for members of Congress to become cosponsors of the Autism Treatment Acceleration Act (ATAA). A key provision of the ATAA requires insurance companies from coast to coast to provide coverage of medically necessary autism treatments, such as Applied Behavior Analysis (ABA) therapy. We need your help to make sure this ad hits home for your federal legislators! Help us make sure that they see this ad over and over again and hear from families and friends of families affected by autism each day this week! 1. Please download and print out a copy of the Autism Speaks ATAA ad HERE! 2. Fax a copy of the ad to your federal Senators and House representative! After printing out a copy of our ad, find a good spot on the ad itself, or on a separate sheet of paper, to write a short personal message asking your Senators and House Representative to cosponsor this bill, be sure to include the bill number - S.819 in the Senate and H.R. 2413 in the House. 3. Follow up with a phone call to our federal legislators! If you aren't sure of what to say when you call, say this:"Hi. My name is ________________. I am your constituent and live in (City, STATE). I am calling to be sure that you received a copy of the advertisement that I faxed to your office regarding the Autism Treatment Acceleration Act. I would like Senator/Congressman (Name) to cosponsor this important piece of legislation. The bill number is S. 819 (if you are calling a Senator) or H.R. 2413 (if you are calling a House Representative). Thank you so much. I will keep checking back to see if he/she has signed on because this is very important to me." 4. Forward this to 20 people and ask them to do the same thing! They do not have to have a child with autism. Post on message boards in your state or forward to coworkers, neighbors, friends and family and ask them to help you help your child by pressing for appropriate insurance coverage for the premiums you pay! Spread the word, get people involved and watch your politicians really start to sign up to help! For more information on the Autism Treatment Acceleration Act, visit www.autismvotes.org/ATAA. To continue receiving alerts about this issue and other pertinent issues in your state, register at www.autismvotes.org! Working together they will hear our community. Working together, we make autism insurance discrimination a thing of the past!